A few months ago we wrote about LA’s first zero net energy classrooms planned for Brentwood School. Students have been using the new Gen-7 classrooms since January. The results thus far? According to the school officials, along with energy savings, the classrooms are offering students and teachers alike a breath of fresh air, quite literally. Students are also engaged with a multitude of interactive features that can be found in the classrooms, including big screen smart boards that incorporate media into their daily lessons. American Modular Systems is the designer and manufacturer of the Gen-7, which are eco-friendly classrooms the designer says are meant to empower communities to create healthy, energy-efficient learning environments that will benefit students and educators for generations to come. 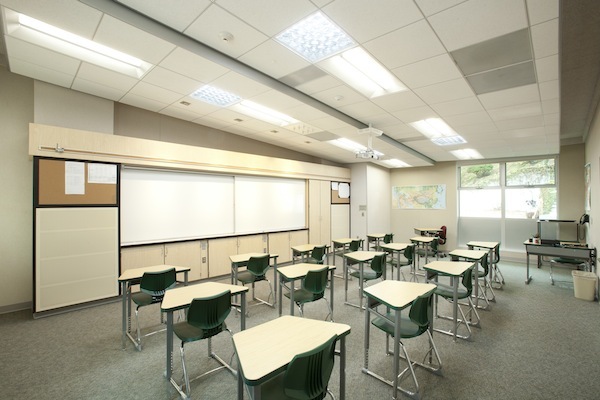 But one of the most measurable and noticeable differences of the new classrooms is the amount of energy savings that is taking place so far. In just one month in operation, the Gen7 solar system produced 4.04 MWh of energy, enough to power 134 homes for a day. It also offset 2.79 tons of carbon dioxide, the equivalent of planting 71 trees. By the end of the year, the classrooms are expected to reduce energy usage by 70 percent, with the buildings designed to meet LEED Gold standards.